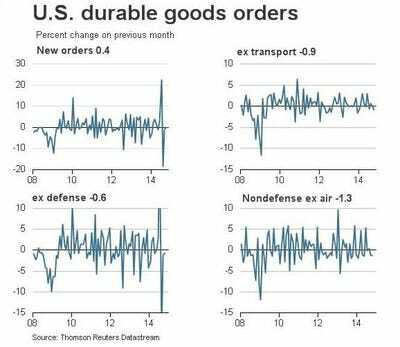 October durable goods orders offered a mixed read on manufacturing industry. 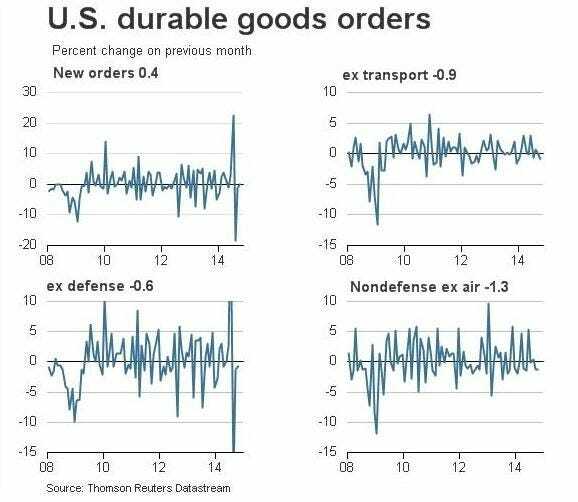 Durable goods orders unexpectedly increased by 0.4% in October following two consecutive months of decline. This was much better than the 0.6% decline expected by economists. This headline number has been volatile lately due an unusually robust month of aircraft orders this past summer. Excluding transportation equipment, orders actually fell by 0.9%. Nondefense capital goods orders excluding aircraft (core capex orders) — an indicator of business spending — unexpectedly fell 1.3%. Economists had forecast a 1.0% increase. “The decline in October core capital goods orders supports our forecast for a moderation in equipment investment in Q4, to 5.0% q/q from Q3’s 10.7% pace,” BNP Paribas’ Laura Rosner said. “We believe that the slowing in durable goods orders reflects companies’ increased uncertainty about the impact of slower global growth and stronger dollar on their demand outlook, leaving many to approach capital expenditure plans with increased caution,” TD Securities’ Gennadiy Goldberg said. Pantheon Macroeconomics’ Ian Shepherdson, however, cautions against reading too much into one month’s worth of data.